Alcohol abuse in high school and middle school students is a problem negatively affecting the physical health, emotional well-being and educational performance of students, both inside and outside the classroom and recent studies have linked early drinking behavior to later alcoholism. 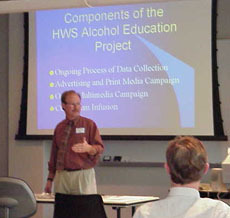 In an effort to educate teachers and administrators, the Alcohol and Other Drug Education Project of Hobart and William Smith Colleges sponsored workshops for professionals working in Seneca County, Ithaca, and Geneva City School Districts of New York State. These workshops introduced the school districts' representatives to the "social norms" approach to education, ways to carry out the social norms model and disseminate its information, and the social norms impact on the Hobart and William Smith campus. Representatives from the schools discussed the social norms approach with the HWS project leaders and later formed groups comprised of members from their own school district in order to discuss dissemination and application of the HWS approach. These groups also identified potential problems and issues that they would like to discuss with the whole group. Wesley Perkins, Ph.D., Professor of Sociology at Hobart and William Smith Colleges. Dr. Perkins is Director of the Alcohol and Other Drug Education Project and is a nationally recognized researcher, speaker, and consultant on alcohol abuse in youth and young adulthood with special expertise on topics of peer, gender, family, and environmental influences on drinking. David Craig, Ph.D., Professor of Chemistry at Hobart and William Smith Colleges. Dr. Craig is Co-Director of the Alcohol and Other Drug Education Project and is a leader in national efforts to reform science education. He has special expertise in teaching about the biochemistry of alcohol and its effects and making the material accessible for students and teachers of diverse backgrounds. I. Presentation of the Social Norms Model for prevention. III. Team break-out sessions: Participants meet in teams by school to describe the approaches that they would like to implement at their school. 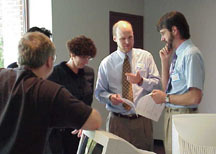 Groups identify potential problems and issues that they would like to discuss with the entire group. IV. Reports from each of the school teams highlight the approaches that each team feels would be best for their environment. Unresolved questions and issues raised for the workshop as a whole to discuss. V. Continue discussions over lunch at the Scandling Center Common Room. This workshop is provided through the support of the U.S. Dept. of Education and Hobart & William Smith Colleges.